I’ve been visiting a friend of mine down the south coast of NSW. Lou is a writer of non-fiction and poetry. She manages to earn a living from it. When times get tough she supplements her income teaching creative writing evening classes. I met her at one of her classes about ten years ago and we became good friends. She has been very encouraging throughout the years regarding anything I’ve written, so I love going to visit her despite always feeling I have disappointed her somehow because I haven’t yet had one of the many novels I’ve written published. I am often attracted to quirky tales; it is no secret. Lou had a ready made one for me when I arrived. She lives very near a beach that is a popular spot for holiday makers. The shelter of a bay calms the waters for swimming. Cliffs rise like totem poles fashioned by the gods as the bay turns to meet the sea. On these cliffs sits the house where one of Lou’s friends, Griselda lives. Griselda’s tale is a very interesting one. I was immediately captivated by Griselda’s name, plucked straight from the Brothers Grimm. I imagined long, plaited hair, petticoats and velvet bodices. Griselda didn’t disappoint. She was dressed in varying shades of layered green with leather clogs and long red hair bundled up into a scarf. She invited us for tea in her house perched on the headland, seemingly placed as precariously as a maraschino cherry on top of an ice-cream sundae. The house on the cliff was snugly perched. Weather beaten as an old fishing boat, with windowsills peeling from the salt spray, its bricks were sun-bleached and crumbling, a fitting part of the landscape which evoked thoughts of Thomas Hardy or Emily Bronte. Griselda told us how she watched the rough seas from her window, pounding against the gnarled outcrops of basalt, making the air white and cold. She could hear the melancholy crying of the seabirds, battered and half-frozen by the cruel wind, yet determined to fish. She could see the beach, sliced up by the tide like an enormous cake with only a quarter-portion left. And she could hear the shouts of the painters as they set up their easels, fighting over the position offering the best light, best perspective. They came every morning, amateurs, wannabes, cramming their canvases with her beach, her seas, her craggy, ancient cliffs. They filled the local souvenir shops and galleries with their efforts, snapped up by ardent Japanese tourists and retirees in hand-knitted cardigans, keen to add to their cache of memories. The painters irked Griselda more than she could say. She scoured the local galleries, searching; fastidious, obsessive, for one glimpse of her house on the cliff. One swirl of paint, a few rough strokes, a careless daub would do. But the painters continued in their collective conspiracy against her. Her house, her hearth, all that she loved, remained excluded from their creative fervour. She took to joining the painters while they worked. The wind whipping her hair against her face, stinging, like the bite of insects on a humid night; words swallowed by the force of the wind. She pointed her house out to those who would listen. 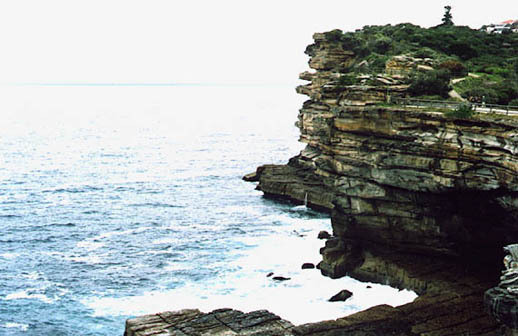 They shook their heads, ignoring her egg-white face, indicating the cliffs and the sea. Disenchanted, she left them, feet leaden as tin cans full of sand. You can see from the photo I’ve taken that is very hard to see Griselda’s house. There is a safety barrier on the cliff which makes it difficult to photograph round the point. I’m sure a better photographer than I, with the right lenses could do so, but I found it difficult. On the beach side it is even harder to see the house – it is overshadowed by trees. Lou and I went down to the beach and chatted to some of the painters, asking if they had ever noticed the cliff house. ‘Didn’t know it was there,’ said one. ‘I’m just painting the cliffs,’ said another. ‘I can’t see it,’ said another. ‘What house?’ said several more. Lou told me a similar sentiment was echoed in the local galleries with many of the gallery owners unaware of a house nestled on the cliff. It seemed incredible to believe that in all the years people had been coming here to paint, not one person had included the house on the cliff in their scene. ‘Well, there is one person,’ Lou said. Back at Griselda’s house, her roof looked like it was being swallowed by cirrus clouds. I felt like a princess in a tower built at the very edge of the world. We were invited into Griselda’s studio at the back of the house. She throws pots for a living which I think is a very whimsical way of saying someone is a potter. The studio was full. Pots, bowls, vases, sculptures, canvases were packed in from floor to ceiling, all sharing a similar motif – a quaint little seaside house held fast onto a cliff. Lou and I sat in the garden. The rusty gray reflection of the raging water below dappled the sun-cracked ground. We sighed, drinking in the celestial beauty. The house was here, it was real, as sure and knowing as the heron circling a school of fish in the distance, as the burn of the brine on our tongues. We knew that whenever we saw the cliffs from now on that we would see it, with fresh eyes, what so many others missed; we would see as if some kind of spell had been broken – the house on the cliff. this gives her and her house an almost mythical quality… and fyi… i can’t see it…. How perfectly lovely. Visiting Austrailia is on my list of things to do before I die. This place is lovely. Now, I want to visit there too. Or maybe I just want to meet Griselda. She sounds like she walks to the beat of a different drummer and that’s a great thing. What a beautiful story Selma. I can believe you have written novels but I am surprised they haven’t been published. It’s lovely having you all to ourselves but I’m sure there would be a lot of people out there who would love to read your lovely work. I just dont understand how someone like you, with such an obvious gift for the written word, isnt an accomplished PAID author? Paisley – that is the irony – no one can see it. I have come to the conclusion that it is shrouded in mist. Coleen – I hope you make it to Australia one day. I’d love to visit the US. I’ve only been to New York which I loved but I’d love to hire one of those gorgeous American cars and drive around the whole country. That for me would be a dream holiday! Gypsy – I had a bit of bad luck with my last novel and I must admit it shook my confidence. I was a hairsbreadth away from being published and the contract was pulled at the last minute due to budgetary restraints. I didn’t write for about 18 months after that and then a friend said I should start blogging as a way of getting back into it. It has helped me enormously and I have also met some wonderful people whom I now regard as friends! Meleah – when I read excerpts from your book I think the same thing. Hey, maybe this is our year! I hope you do get your manuscript submitted again Selma, because I would LOVE to have a book written by you. Hm, maybe I could come to Australia and have it autographed! Griselda sounds fabulous, definitely someone who would enjoy living in a house on a cliff, where mounds of wet clay are transformed into things of beauty. Hmm! I wonder if some of those artists ought to have taken a walk on the cliff-top before they painted it? Y’see, there’s a painting by JMW Turner of a Yorkshire village, with a lake in the background. The lake’s there, all right … but there is NO WAY you can see it from the point of view of the painting! Lovely post, Griselda sounds a great person. Its intriguing to think why so many people claim not to be able to see the house – do they want to pretend that area of cliffs is pure wild nature? are they, despite being artists, not as observant as they think they are? do they just not see it because they’re not expecting it to? does the house really blend in that well? I would venture to say that Griselda is no more mystical than me… that is until you put your words to her, and I not only see the house in that photo, I also see the crumbling weather beaten bricks and peeling paint. Your words paint beautiful pictures. This is a truly stunning tale. The house is very hard to see but I think that’s probably one of the beautiful things about it. Your words are so calming. This is a lovely post – Griselda’s house sounds so special as does she! You are fortunate to have visited her and have a remembrance of the house. I’m with everyone else – your writing is beautiful and I imagine a novel of yours will be a wonderful treat to read. Oh My God I love the way you write – I felt as if I was right there with you experiencing it all!!!! I am very visual person so when I read books its like a movie in my head – if after the first couple of pages there is nothing then i can’t read… everytime I read your blog my mind can imagine it all – you are amazing – I wish i could write like you! I squinted and squinted at the picture and finally saw the house – I would be afraid to live up there, maybe one day when I visit the down under I will go photograph that house on the cliff and then draw it! KAREN – if that day ever arrives you will be the first to get an autographed copy. I’ll send it to you myself! I love your final sentence…..lovely. TRAVELRAT – perspective is a very interesting component in art. In this case it got me thinking that perhaps the house was excluded so often because people were actually painting what they had seen in other paintings and not what they could see with their own eyes. CRAFTY GREEN – the house does blend in well but from the beach side you can definitely see it. I was surprised so many people left it out. It was as if all that mattered was capturing the cliffs. The finer details seemed irrelevant. ANGRY – you are a sweetie. BEC – I’m going to borrow one of those cameras with the big zoom lenses the next time I go down there so I can capture the house. It really is worthy of being painted. I’m glad you found the story calming. I find writing calming so if I can create that feeling for someone else it makes it all the more worthwhile. Cheers! KATE – so glad you visited. Maybe one day I will get that novel of mine done. Griselda was/is a really fascinating person. TBALL – you know, it would be a bit unnerving to live up there. You really are at the mercy of the elements. I experienced a slight sensation of vertigo when I was up there. Thanks for your very kind words! What a wonderful post this was. I loved reading about Griselda and her beloved house on the cliff. You made me feel like I was right there. My sentiments exactly about your writing! You are the real deal — get yourself an agent!!! I love your work!!! I agree with Angry : Selma, you have painted Griselda’s house for her in words. INGRID – thank you. I’m so glad you liked it. TR – aww, you’ve made my day. DAOINE – one day we definitely have to meet. We are only a state away. I would love that! DAOINE – I’m going to resolve to make it happen sometime this year. I spend too much time working and not enough time having fun. It’ll be great! You have such a way with words! I especially liked this simile: “She invited us for tea in her house perched on the headland, seemingly placed as precariously as a maraschino cherry on top of an ice-cream sundae.” Keep writing, dear heart, please keep writing. BONNIE – writing is a pleasure when I receive lovely comments like yours. I really appreciate your kind words. I hated to dump all my interests on the heads of any one group of readers, so I divided them up into blogs dedicated to reading (Bonnie’s Books), writing (Words from a Wordsmith, Bonnie’s NaNoWriMo Blog, Weekend Wordsmith), save the planet (Greening the Blue Planet), making the world a better place (Continuing the Quest), discussing books (Book Buddies), and so forth. Thanks for coming by to visit. I plan to visit here regularly. BONNIE – you are so industrious. I am going to enjoy checking out all of your blogs. Thanks for the link!